Backbends are invigorating, uplifting, and heart opening, but often many Yogi's find them quite a challenge. Much of our modern life is spent hunching over smart phones, sitting in front of computers, driving and other activities which require bending over. Carried out wisely backbends can counteract and balance all this forward folding, creating more space for the spine to be free. This workshop will approach backbending in a softer, more embodied way through Somatic Movement, Feldenkrais and Scaravelli inspired Yoga. We will explore the movements of the spine with deep awareness to allow you to experience lightness, space and ease. break down individual elements to release tension from your upper-back, chest and thoracic spine. Come along be revitalised, balanced and inspired. It's suited to Yoga students and teachers and all those interested in functional movements. 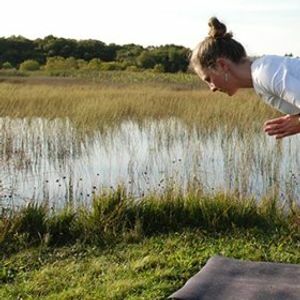 This workshop is led by Deirdre Mullins - Somatic Exercise Coach, Clinical Somatic Educator(500hr) and Yoga teacher with over 10 years teaching experience. She is passionate about sharing Somatic body-mind awareness practices which improve mobility, stability and function.